On Friday September 19th we started the morning with a photo shoot for the Advertiser-Tribune newspaper in Tiffin, OH and then had a radio interview with a Tiffin radio station. 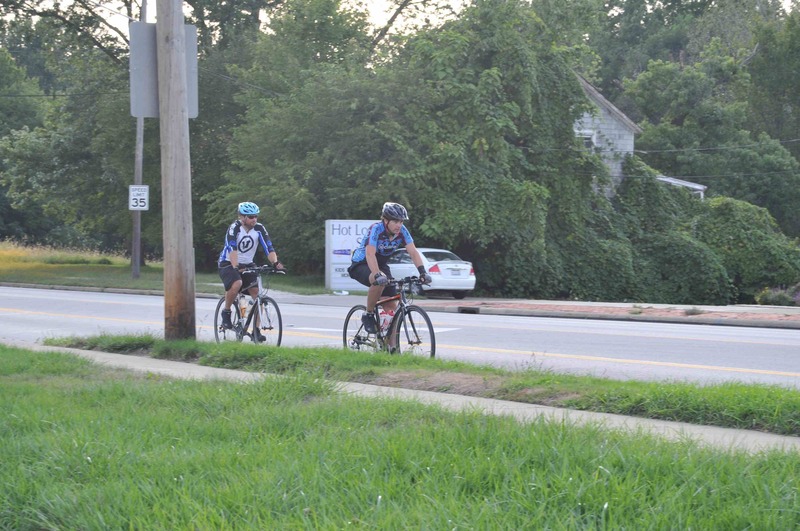 Outside of Cleveland, Pearson and Pete were riding through heavy suburban traffic when a minivan turned left into them. Pearson’s front wheel was hit, he put his arms out and caught himself on the side of the van fell on his wrist. The van tried to drive away, the driver claiming she never saw them. They were both very shaken and Pearson was badly bruised from the handlebars but it could have been much worse. Unfortunately the driver did not seem shaken up proving that there is still a long way to go to have drivers respect the vulnerability of cyclists. On Sunday September 21st we started our rest day in Erie with an interview for WICU tv. In the evening we had a great home-cooked with my mom and Meghan’s family- Thank you! 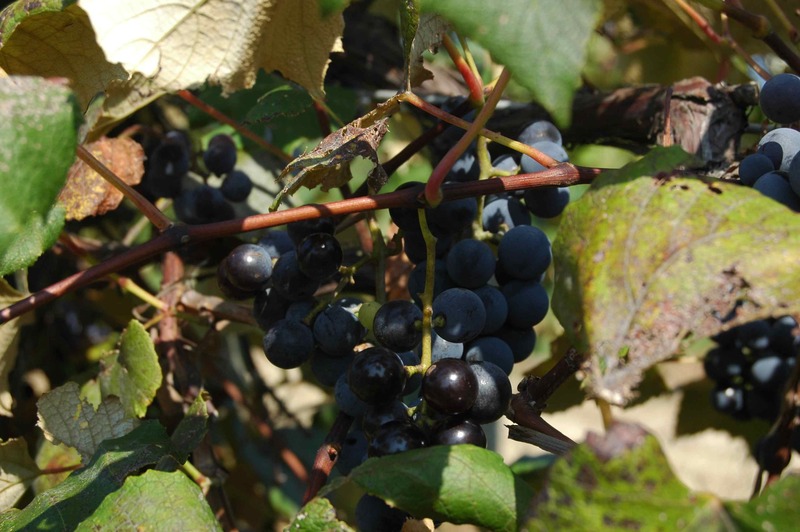 On Monday September 22nd we traveled out of Erie and into the vineyards of Northeast, PA and Western New York. Pearson made it through Pennsylvania without a flat tire! We enjoyed the sweet smell (and taste) of grapes all day- I wish I had “smell-o-vision” to capture the wonderful aroma and add it to the film. We ended the day at Duff’s in Orchard Park, NY (just off Route 20) where we were greeted by my Grandparents, my aunt Joy, her boyfriend Greg, my uncle Jack and aunt Nancy. We had a brief interview with WIVB tv station http://www.wivb.com/Global/category.asp?C=104633&nav=menu41_2_6 and then my Grandparents treated us to a dinner of Duff’s awesome wings- Thank you! On Tuesday September 23rd some of the 30 miles we “found” in Nebraska (miles Pete and Pearson had to ride that weren’t listed on the itinerary) were “lost” today when we realized it was only 67 miles to Lima, not 90—I think this was a more pleasant surprise than the extra 30. 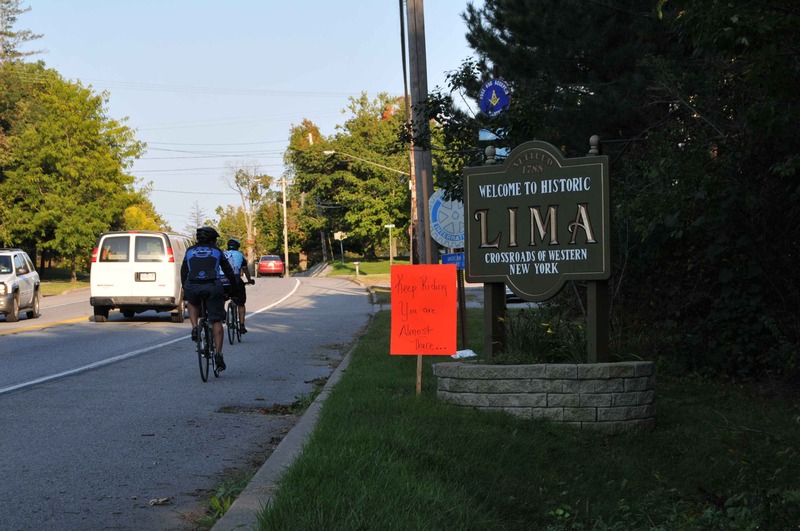 As we got close to our destination of Lima, NY there were signs to along the road to greet us and food, wine and beer for us to enjoy at the end thanks to my aunt Christine, aunt Sharon, uncle Dana and cousin Dylan—Thank you! On Monday September 15th Pearson and I spent a couple of hours having his left arm examined and x-rayed in Chicago. The good news is it’s not broken, but the bad news is it’s still swollen and painful. We received a great care package of fresh baked goods, cheese, sausage and other goodies from Erin’s Grandmother and Aunts—Thank you! 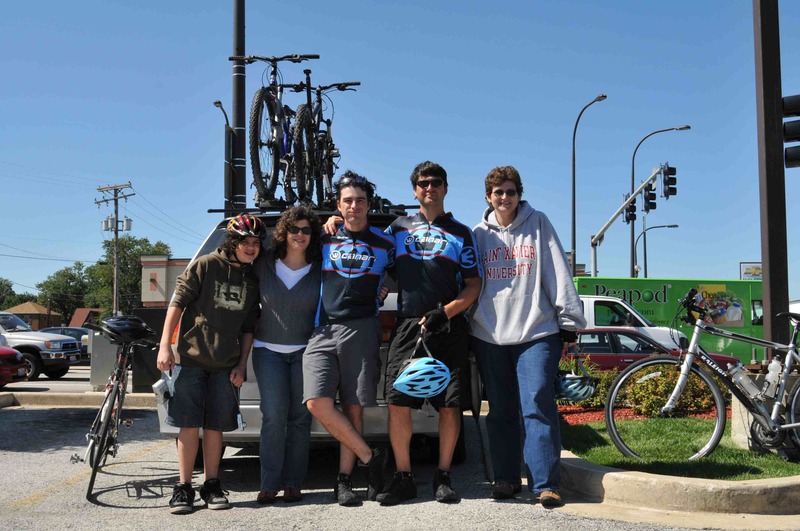 On Tuesday September 16th we headed out of Chicago in the sunlight- something we haven’t seen in many days- and met up with Nancy, Lisa and Daniel in Evergreen Park. 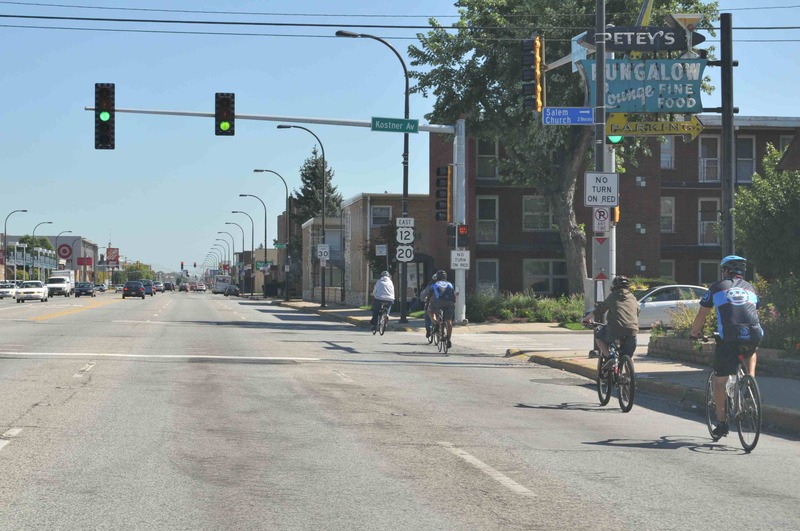 Nancy and Lisa have spent the summer biking instead of driving and they led Pearson and Pete from Oak Grove to Evergreen Park. Just before entering Indiana Pearson got flat #15. We were concerned about detours through Gary, IN because of all the flooding (I-80& I-94 were closed) but we made it through without any major flooding on the roads. 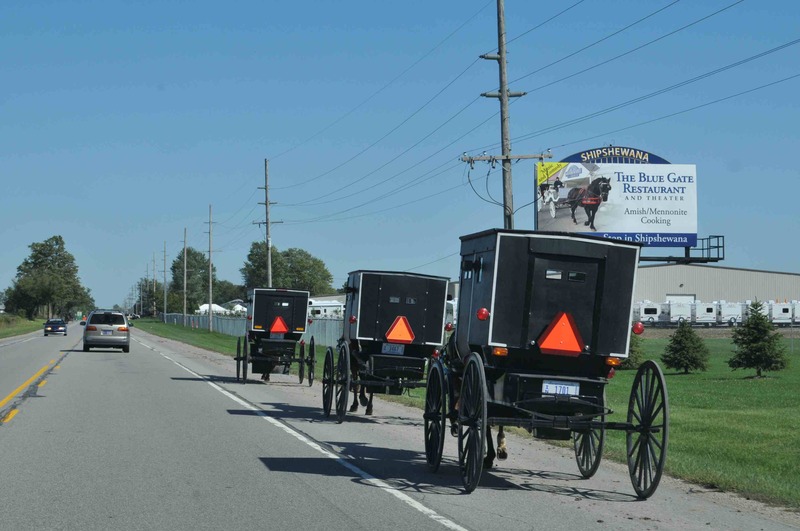 On Wednesday September 17th we traveled through Shipshewana, IN home of the largest Amish community in the world. We saw more bicyclists (and horse and buggy) here than on the entire rest of the trip. Just before the Ohio border Pearson started to think he would make it through a state without a flat, but alas he blew out his back tire (#16) and found that he didn’t have another spare tube. After trying to MacGyver the back tire he gave up and rode his mountain bike into Ohio. The closest bike shop along our route was in Toledo, 65 miles from Thursday September 18 start point so Pearson started the day with a flat back tire. After struggling to pump up the tire every few miles and battling a head wind (again employing the PAT) Pearson switched back to his mountain bike for a while. He finally made it to the bike shop, bought a new tube and tried to catch up with Pete. Today we have a photo shoot for the Advertiser Tribune newspaper in Tiffin, OH and I will be on the radio in Cleveland on WTAM. 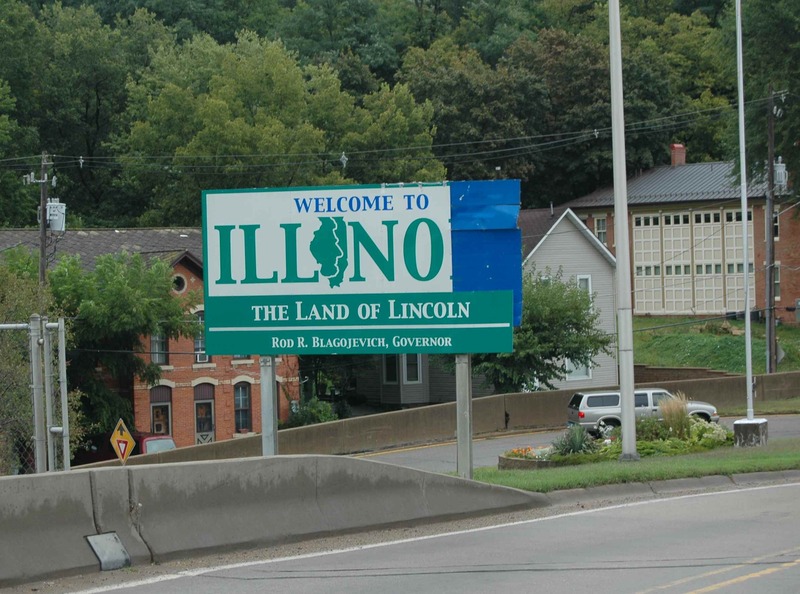 Out of Nebraska, Through Iowa, Into Illinois! 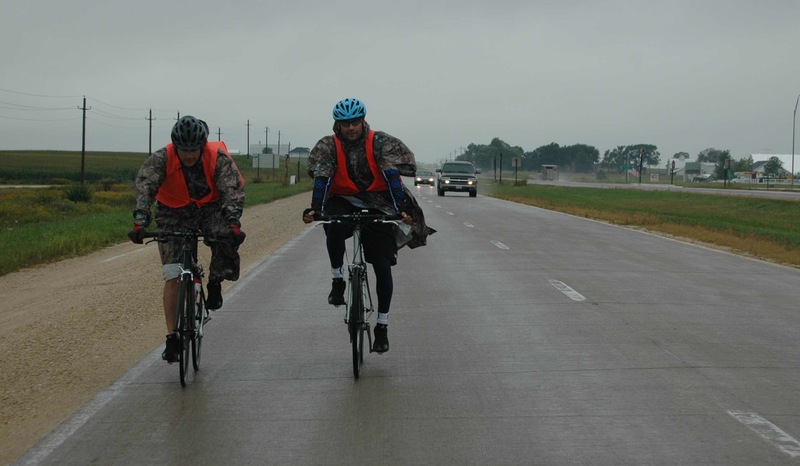 On Saturday September 6th we traveled from O’Neill, NE to Randolph, NE in the rain. 18 miles from our destination Pearson found himself with flat #10 and sick of changing tires he finished the day on his mountain bike. 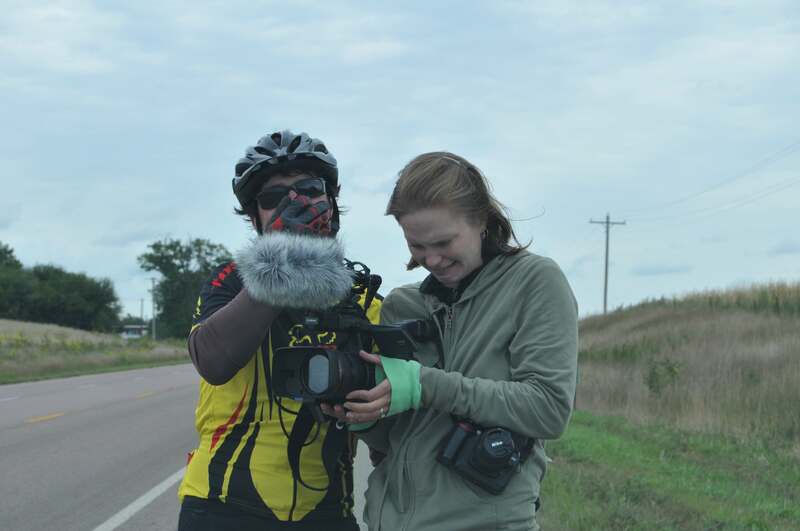 On Sunday September 7 P&P cycled into across the Iowa border and into Sioux City. Pearson tricked Meghan and me into stopping downwind of an enormous cow farm; he found our reaction to the stench hilarious. 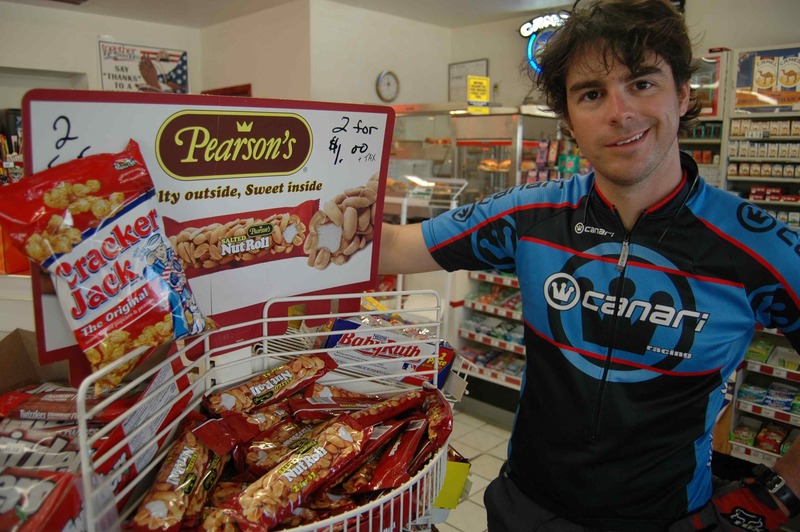 We passed a sign for “Pierson 5” which reminded me of the “Pearson Detour” that we passed outside of Douglas, WY and the Pearson’s Salted Nut Roll candy bars that are everywhere out here. We also traveled by a huge wind farm! 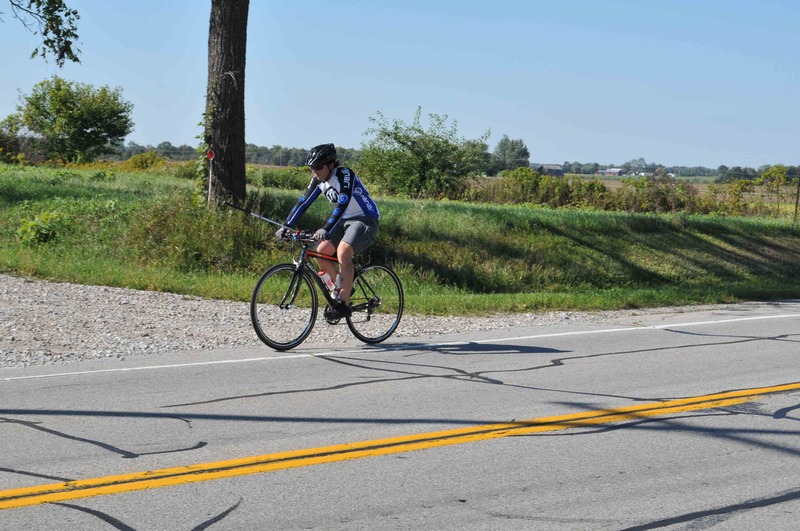 Iowa’s roads either have no shoulder (just road, a white line and grass) or a gravel shoulder so P&P ended up riding on the white line. 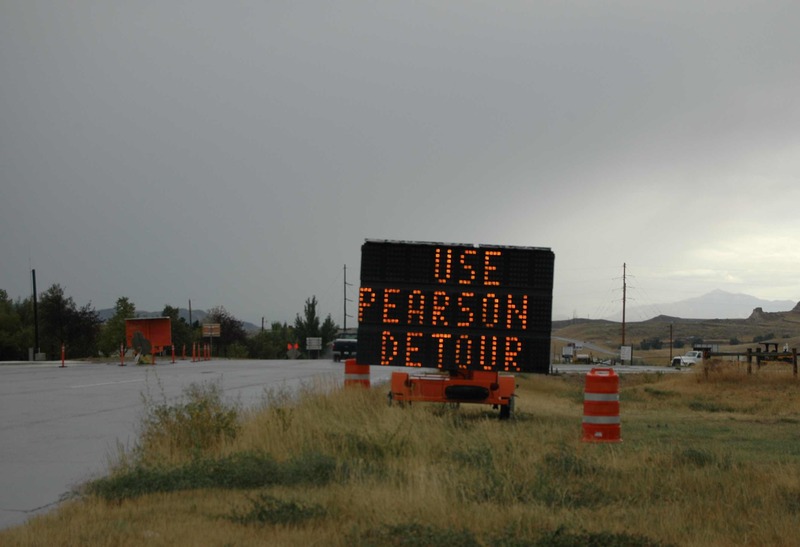 Most drivers were respectful, giving Pearson and Pete ample room when passing them, however on Wednesday September 10th there was one scary, close call. While riding on the one inch of pavement right of the white line a trucker started honking at Pete to get off the road, with no where to go Pete held his line and the trucker came within inches of him. Halfway through the day’s ride P&P took a detour to avoid 20’s merge with I-380. 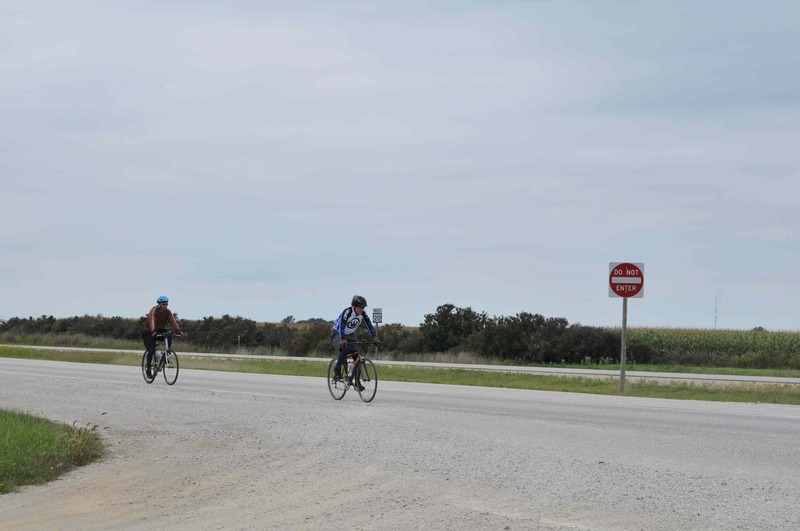 After a few miles they ran into unpaved side roads (most side roads in Iowa are unpaved) and they rode their Raleigh bikes through gravel until Pearson got flat #11. 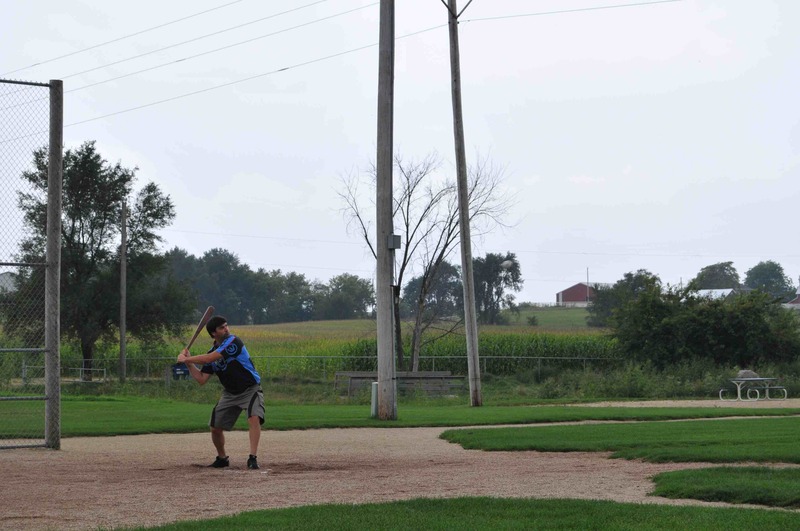 On Thursday September 11th We got lost trying to find our way to Old Route 20 from downtown Waterloo- the Iowa roads even confused our GPS. 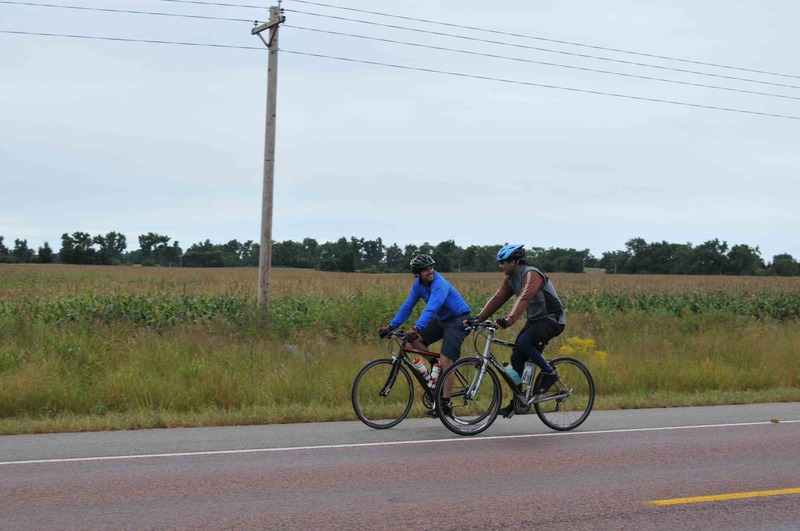 Pearson and Pete battled food poisoning but managed to pedal from Waterloo to Earlville, Iowa. 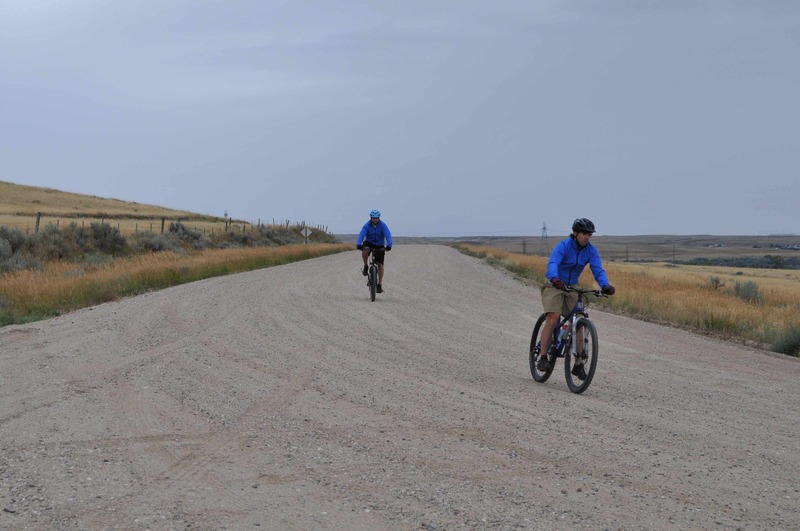 They didn’t find better shoulders but did manage to avoid gravel until the last ½ mile. Before Pearson even got on the road on Friday September 12th he found flat #12- which must have been acquired from the gravel road to the hotel. Lots of rain on Saturday September 13th allowed Pearson and Pete to debut their new camouflage rain gear- the orange safety vest made the outfit! On the way out of Iowa and off its treacherous roads, Pearson got a tire stuck in a rut and took a hard fall onto the wet highway and injured his left arm. He still managed to ride one-armed and crossed the Mississippi into Illinois. With the rain and fog Illinois looked a lot like Ireland. We then headed back into the rain. When we reached Chicago we had to contend with delays and road closures due to severe flooding from record rainfall. Today we’re hanging out in Chicago and getting Pearson’s arm injury examined. Tomorrow we’re heading through Chicago and into Indiana! 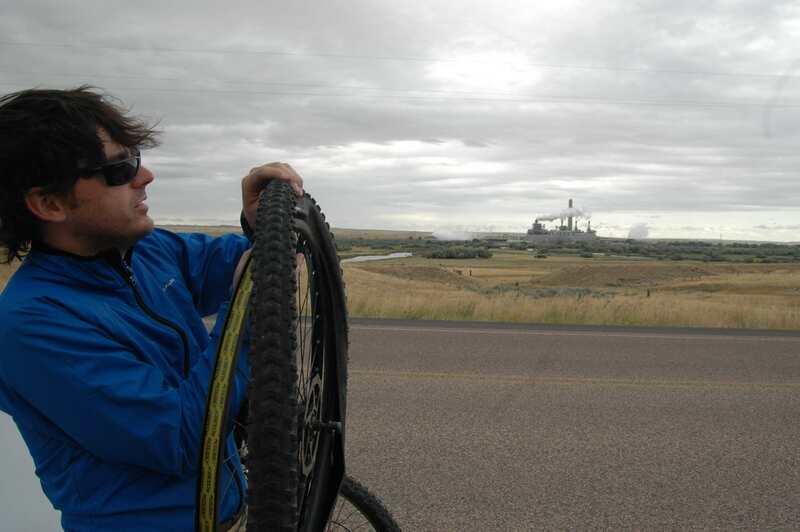 Pearson and Pete rode mountain bikes for 20 miles on an unpaved gravel road (Tank Farm Road) to avoid the interstate. Just as they turned onto Tank Farm Road Pearson got a flat tire (#9 for those who are counting). And halfway through the dirt ride Pete was charged by a cow. We stopped in Douglas, WY to warm up, eat and wish the rain away (which worked for a while). 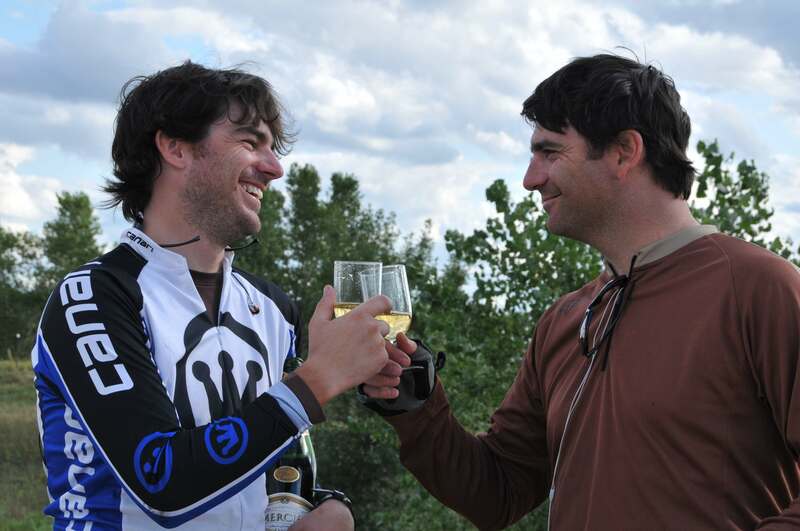 P&P made 101 miles (after the long 137 mile day to Casper!) but had to stop 10 miles outside of Lusk because it was too dark to continue. 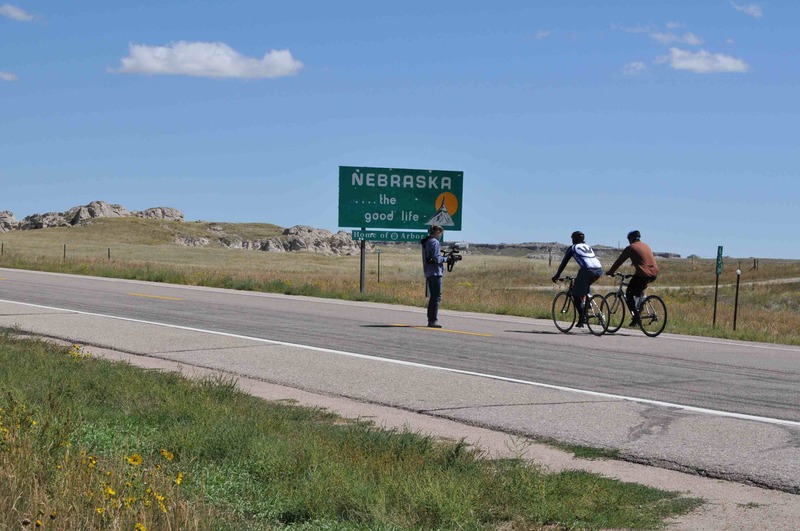 On Tuesday September 2nd we began again 10 miles west of Lusk and traveled across the Nebraska border to Chadron, NE. As soon as we crossed the border we were greeted by friendly people: waves from drivers, smiles from strangers and people chatting with us every time we stopped. 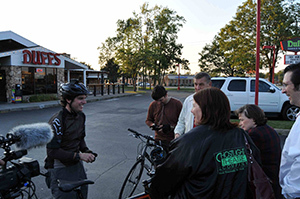 We found great hospitality and excitement about our project from Annette and her family at the Bunk House Motel. She even called the local media for us. 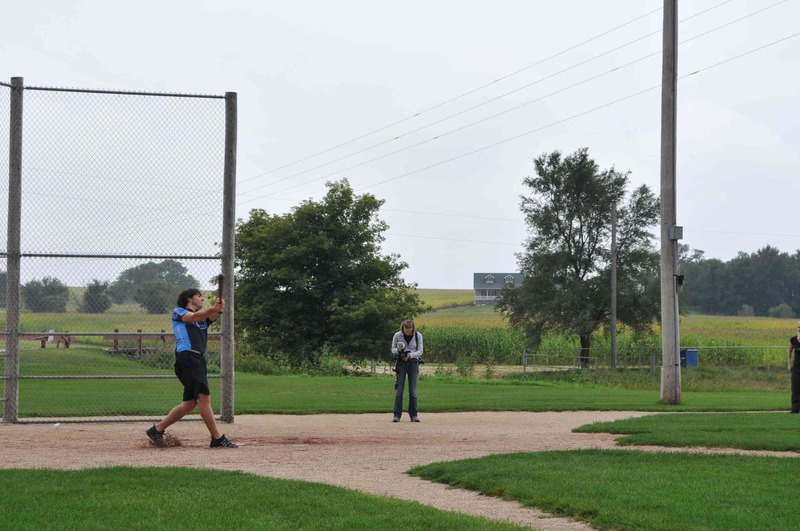 Check out the article from the Chadron Record. On Wednesday Sept 3rd Meghan, Pearson and I took the day and drove up to South Dakota to briefly explore the Badlands and see Mount Rushmore and Crazy Horse. 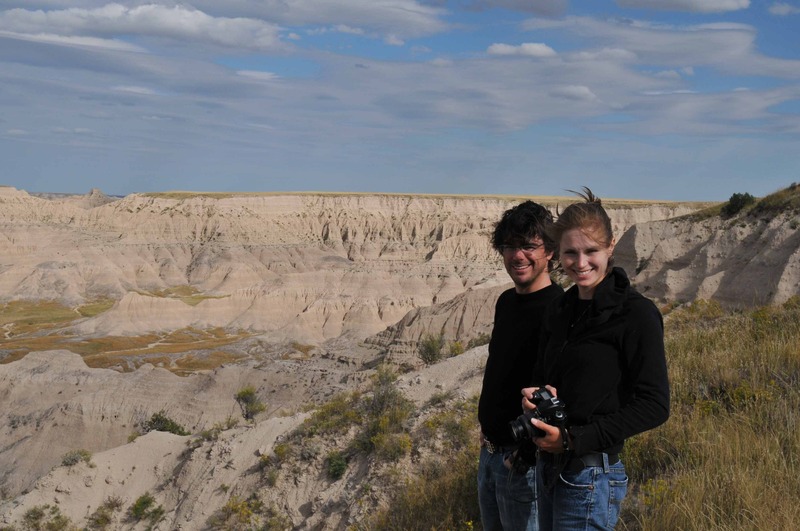 We had a great time and can’t wait to return to spend more time in the Badlands. On Thursday Sept 4th we found a big itinerary snafu. 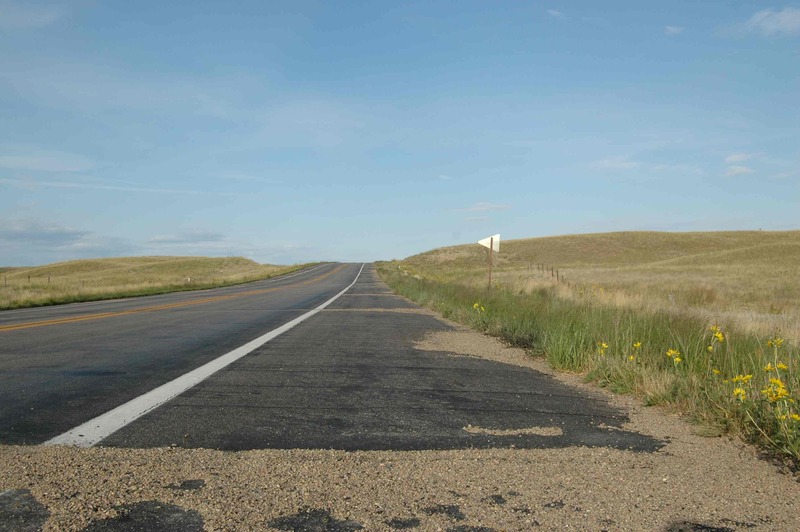 Chadron to Valentine was listed as a long, but manageable 109 miles, but was actually 139 miles. To make the day longer and more painful there are large cracks across the road- sometimes unfilled, sometimes covered with loose gravel- every 100th of a mile. The unrelenting road condition did quite a number on P&P’s wrists, arms and saddles and really hurt Pearson’s back and knee. When we arrived in Valentine late in the evening (after crossing into Central Time) we met Howard the super nice and hospitable owner of the Motel Raine who very generously put us up for free! 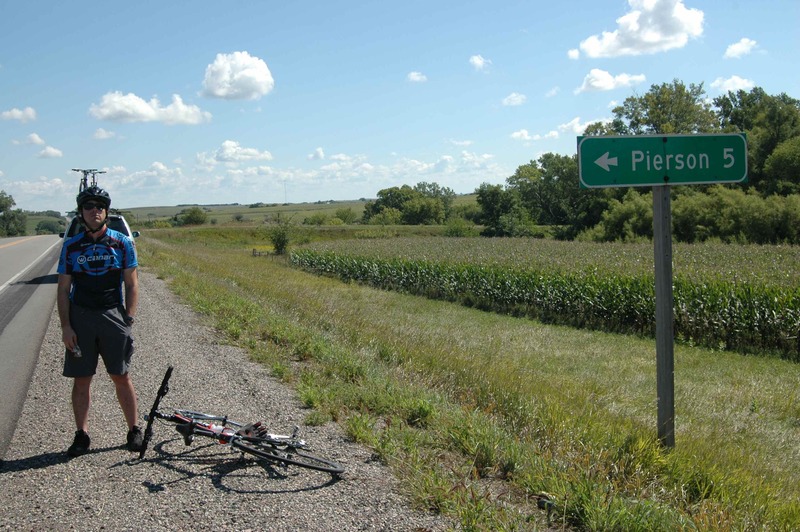 Somehow Pearson and Pete got up on Friday September 5th and rode 115 miles (which makes 564 miles in 5 days of cycling) to O’Neill, Nebraska. Late in the afternoon we passed the halfway point of the country/ trip: Stuart, Nebraska. We stopped and had a champagne celebration which was bittersweet because while it’s great to make progress, we don’t want to see the trip end. 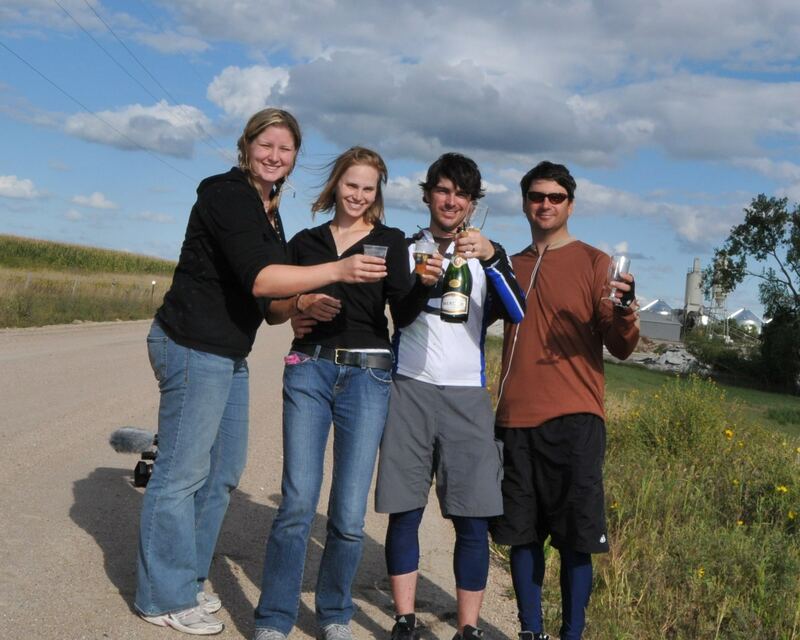 Meghan, Julia, Pearson & Pete celebrating halfway! Today we’re traveling to Randolph, Nebraska and unfortunately it will be our last night in Nebraska. The people here have been so friendly and hospitable and we can’t wait to return and spend more time! Thank you to everyone for your comments and support! On Thursday August 28th we left Yellowstone (and the comfort of great home cooking) and returned to the road traveling to Emblem, WY (population: 10). Just outside of Yellowstone we traveled through a forest fire, the smoke was so thick it blocked the sun and cast a strangely beautiful orange hue over the mountainous desert landscape. 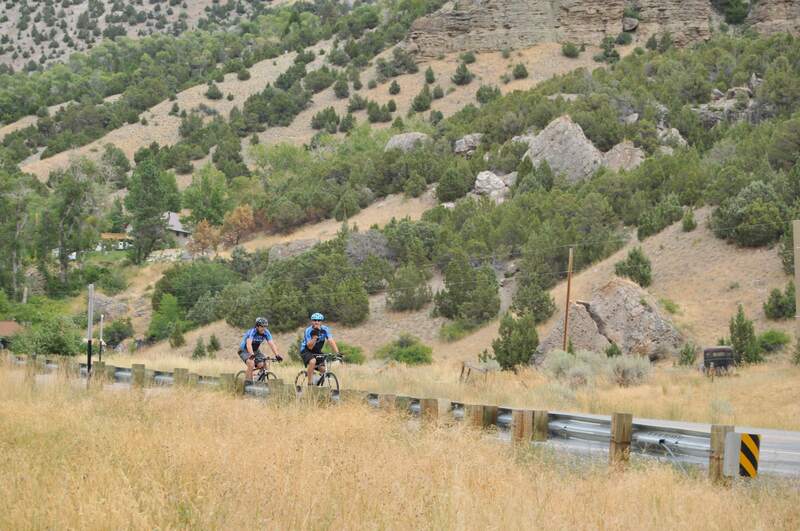 On Friday August 29th P&P rode through swift head winds to Thermopolis, WY. 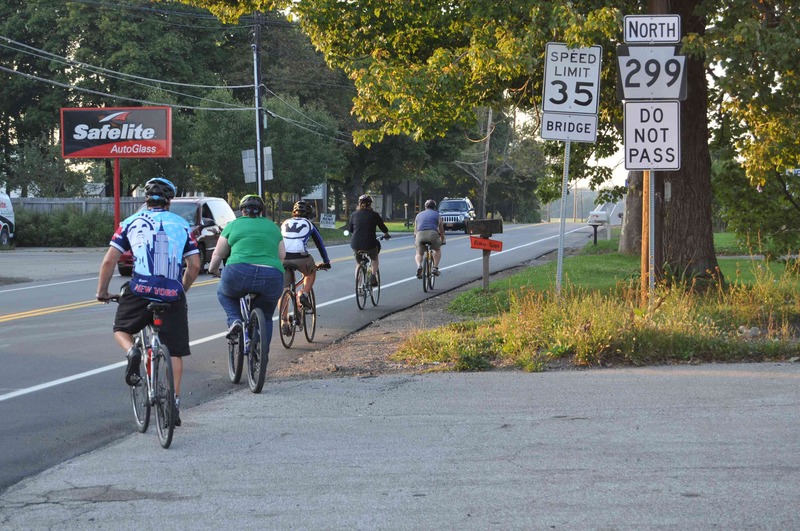 Somehow the head wind followed them even after Route 20 turned from Eastbound to Southbound. Poor Pearson suffered two more flat tires (the total is up to eight) but on the bright side he’s getting better at changing the tubes. Saturday we relaxed in Thermopolis, home of the world’s largest Hot Springs. 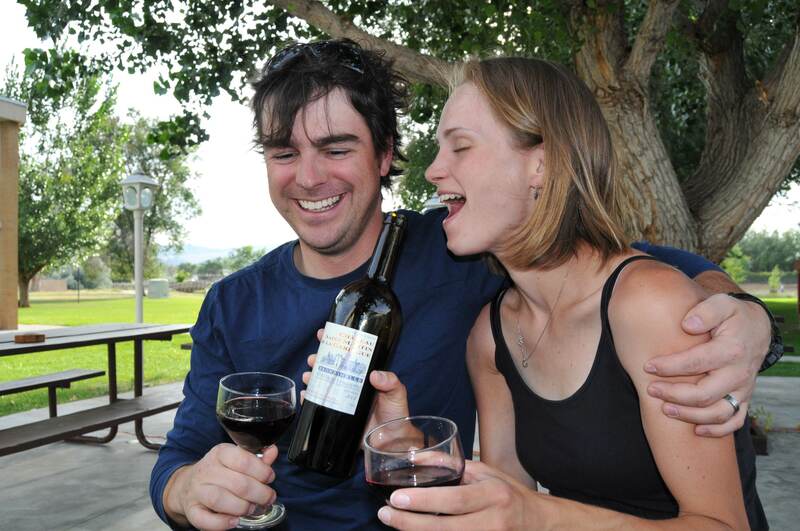 Pearson and I are celebrated our 1st anniversary a few days early by popping a very nice bottle of red wine that Patti & Jeff Evans gave us while we were in Bend, OR. 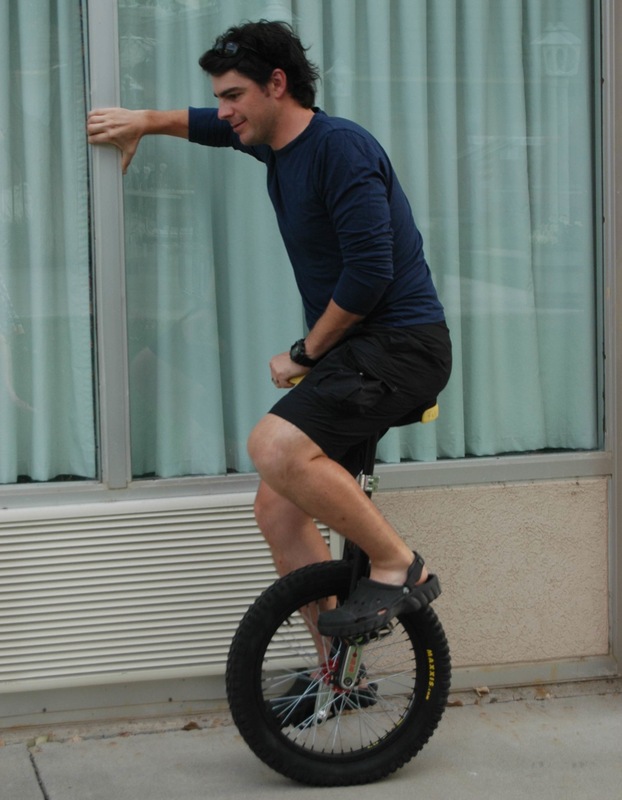 Pearson tried out a unicycle at the hotel but decided to stick with two wheels for the rest of this trip. 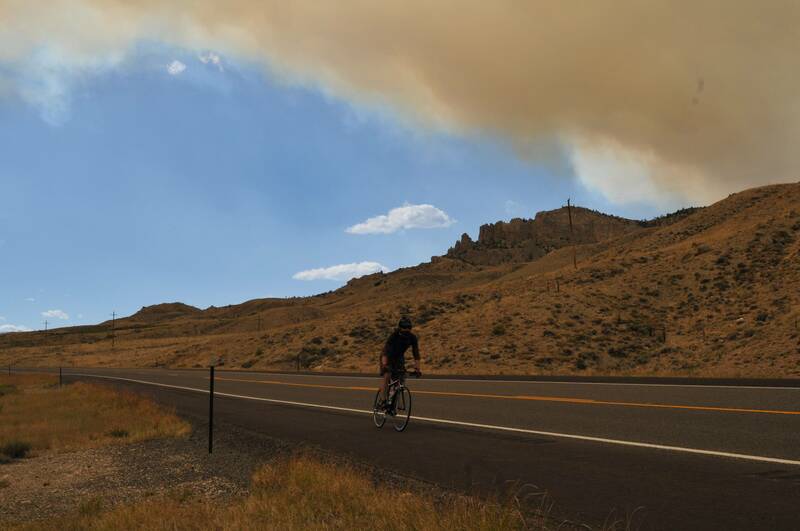 Sunday August 31st P&P completed the longest ride of the trip: 137 miles to Casper, WY. Their saddle sores worsened, but otherwise it was a successful ride. On a more personal note—now that we’ve returned to the sparsely populated desert, with 50+ miles between gas stations, stores and rest stops, it’s again become a challenge to find restroom “facilities”. I’ve never been picky, but shallow ditches and low shrubs don’t work easily on the trafficked Wyoming roads like they did in Oregon: where we didn’t pass another car for half an hour or more. Today we’re off to Lusk, WY—a small town that I’ve heard a lot about and am excited to check out.